Love That Max : Did you always know your partner would be a great parent? Did you always know your partner would be a great parent? Funny how your partner can make you swoon in a whole other way once you have kids. From the start, Dave was the sweetest, most warm-hearted guy I'd ever met and I figured he'd be a good dad. I couldn't have imagined just how good of a dad he'd be. Dave is incredibly attentive to both the kids, whether he's playing with them outside, escorting them to activities or just roaming around town. He gladly goes along with Max's interests/obsessions, why he has spent a whole lot of time at our local fire station with Max these past couple of years. When Max says "Eeease!" ("Please! "), Dave cannot resist even when I can ("You were just there yesterday!") When Max was in his car wash phase, Dave went to a whole lot of car washes. He is always game to find new firehouse-themed restaurants to explore. 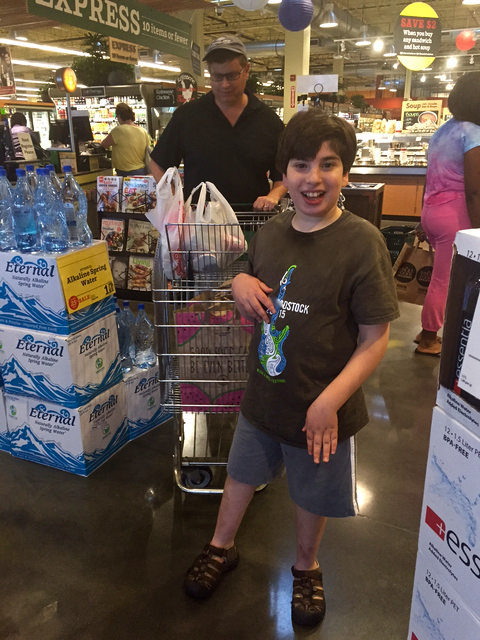 Dave never, ever hesitates to take Max anywhere, whether it's grocery shopping or to a special program. This was especially admirable when Max used to not go to places so easily, and Dave had to weather tears and meltdowns. Dave never runs out of patience or gets grumpy (unless he is hungry, same with Max). Dave is plenty hands-on, too. From the day we brought Max home, Dave changed diapers. "Wow, that's a man-size poop!" he'd boast. He helps Max in the shower. He helps him at meals. And while he has always said, "I don't do clothing!" some days he ends up dressing Max and sometimes the clothes even match. His other nickname besides Marshmallow Dave is PDA (Public Dave Affection) because he is full of hugs and kisses. Nothing makes me melt like watching him lavish the kids with love or seeing one of them snuggling into him when they're not feeling well or tired. So, yes, when you're dating someone you think you can tell what sort of parent they'll be. Obviously, neither of us could have known just what kind of challenges would lie ahead. Dave has lived up to them all. He is the father I dreamed of, and more. He sounds like a great guy. There are not too many people like him.